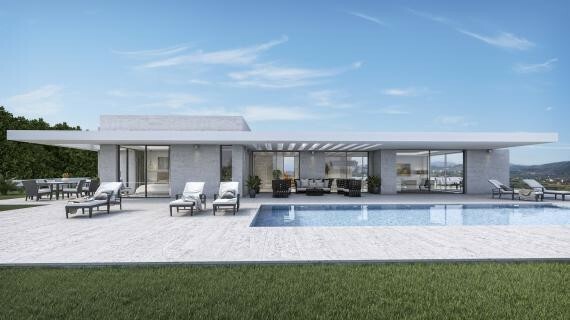 Beautiful design villa in MONTE OLIMPO RESIDENTIAL just 7 minutes from the sandy beach of Javea. The urbanisation is one of the most modern in Javea and has a perfect infrastructure including sewage system, main gas, all cables underground, street lights aso. The 1000sqm plot is completly flat the villa is fully orientated to the south to maximize the sun hours during the whole year. The villa has been designed on one floor for comfortable living with one master bedroom with bath en-suite and direct access to the pool and two more bedrooms with a shared bathroom. A big living space with open kitchen and also direct access to the terrasses and pool area makes it very easy to enjoy this villa. Behind the kitchen we will find a storage and loundry. The big terrases and private pool invites you to enjoy the Spanish way of life.